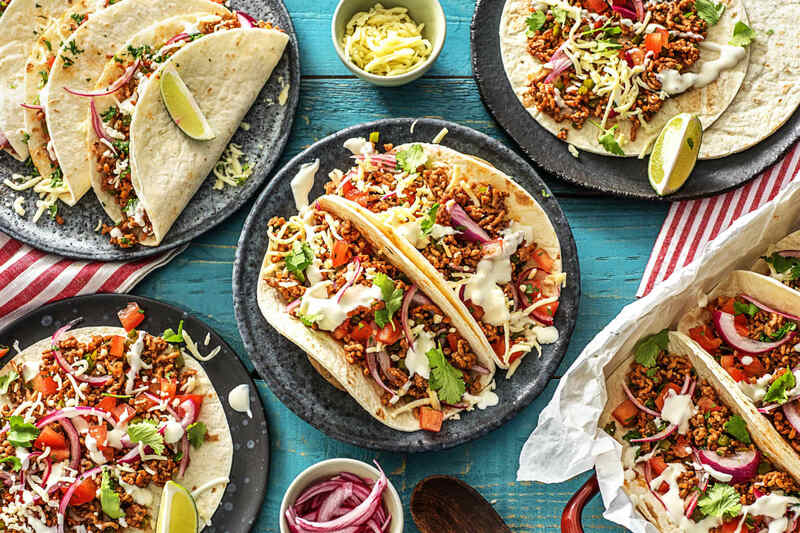 Think of this as a quicker, weeknight-friendly version of carnitas, one that doesn’t involve hours of slow-cooking like the dish typically would. 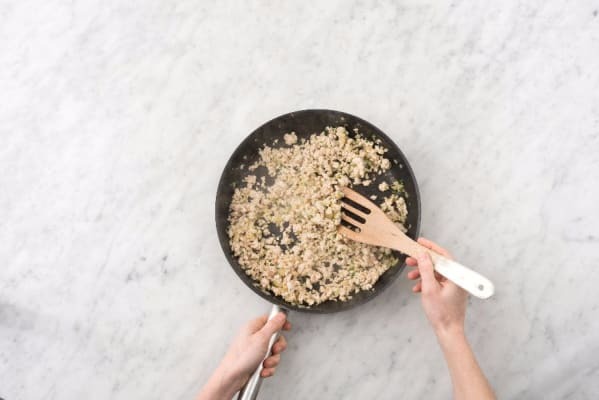 To create that deep, warm profile in minimal time, you’ll add a spice blend and a bit of stock to ground pork, which makes it nice, rich, and saucy. 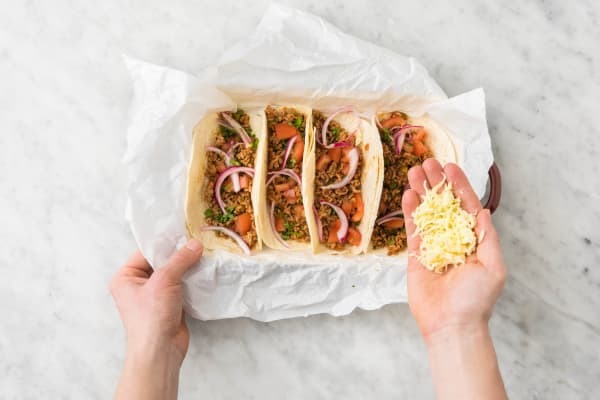 It’s the centerpiece of these tacos, which come with lots of tasty toppings that everyone can add as they please. Wash and dry all produce. Halve and peel onion. Finely chop one half; very thinly slice other half from pole to pole. Core, seed, and finely chop poblano. Roughly chop cilantro. Core and dice tomatoes. Halve lime; cut one half into wedges for serving. 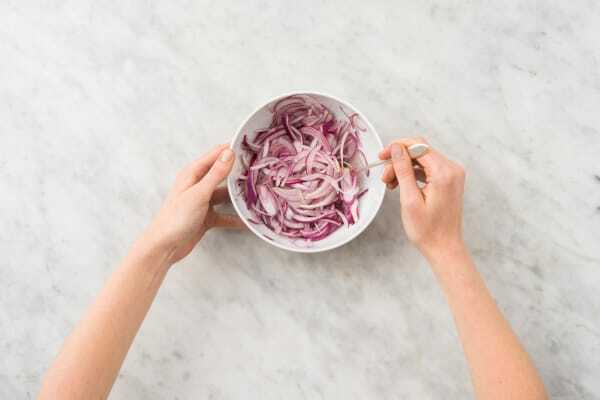 Add sliced onion, vinegar, 2 tsp sugar, ½ tsp salt, and 1 TBSP water to a medium bowl. Toss until sugar and salt are mostly dissolved. Set aside to marinate, tossing occasionally. Heat a large drizzle of olive oil in a large pan over medium-high heat. Add pork, breaking up meat into pieces. Season with salt and pepper. Cook until browned, 4-5 minutes. Transfer to a plate using a slotted spoon. 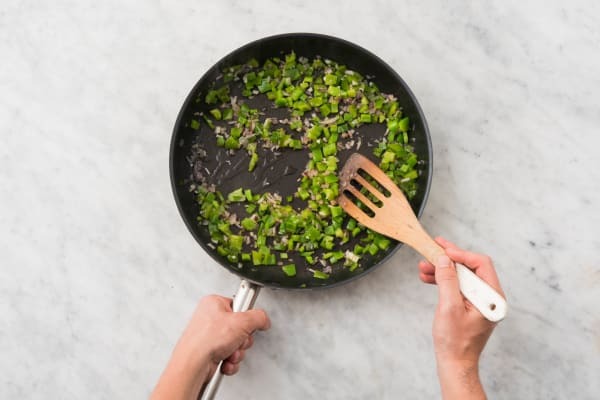 Pour out and discard any excess grease in pan. Heat another large drizzle of olive oil in same pan over medium-high heat. 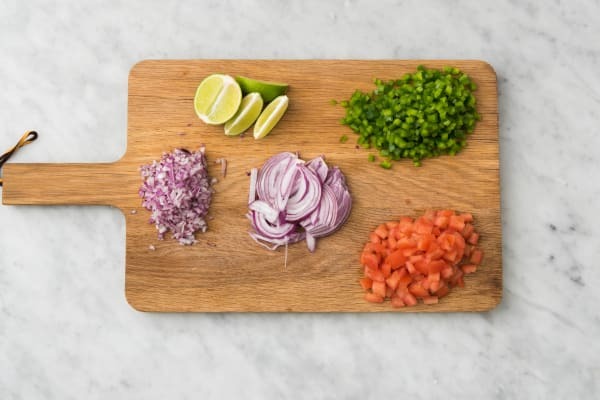 Add chopped onion and poblano. Season with salt and pepper. Cook, tossing, until softened, 3-4 minutes. Return pork to pan and add fajita spice, 2 TBSP tomato paste (we sent more), stock concentrate, and 2 TBSP water. Cook, stirring, until everything comes together in a saucy mixture, 2-3 minutes. 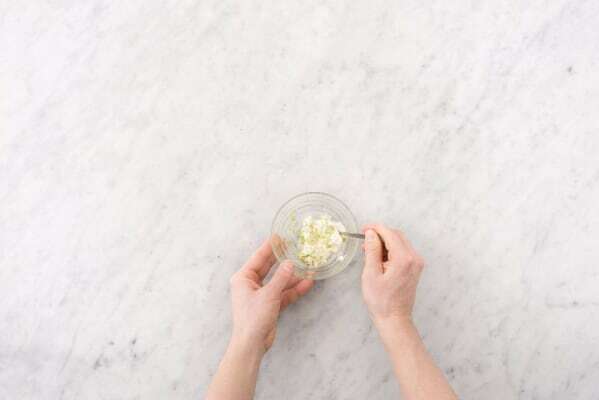 Combine sour cream, a squeeze of lime juice, and a pinch of salt and pepper in a small bowl. Stir in a splash or two of water to give crema a drizzly consistency. Meanwhile, wrap tortillas in a damp paper towel and microwave on high until warm, about 30 seconds. Divide filling, tomatoes, cheese, cilantro, pickled onion, and crema between tortillas. (TIP: You can put everything in individual serving bowls and let everyone assemble their own tacos.) Serve with lime wedges on the side for squeezing over.